Towards the end of the Clone Wars, manufacturer Kuat Drive Yards developed a more refined starfighter�the Eta-2 Actis Interceptor�based on experience gained from the Delta-7 Aethersprite. 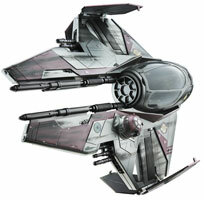 These fighters were used in large numbers during the Clone Wars, including the Battle of Coruscant. Several years after the Clone Wars ended, Kuat sold the entire Delta line to Sienar Fleet Systems. Many of the design concepts of the Eta-2 Actis were incorporated into the later TIE designs, including the solar panels and ion engines. While notable for their role in the Clone Wars, these fighters were not popular among their pilots. While Jedi reflexes and intuitions combined with the incredible responsiveness and agility of the Eta-2 Actis created a devastating fighter, pilots without those enhanced abilities fared less well against their droid opponents. Lack of computer enhancement in fire control and responsiveness doomed the Eta-2 to the history bin once the Jedi pilots were purged. Dual combat stats, the first with a normal pilot and the second with a skilled Jedi at the controls. Eta-2 are merely adequate for most pilots, but in the hands of the Jedi is a remarkable craft.